If you want to deploy a worker application that processes periodic background tasks, your application source bundle must also include a cron.yaml file. For more information, see Periodic Tasks. If you are deploying your application with the Elastic Beanstalk Command Line Interface (EB CLI), the AWS Toolkit for Eclipse, or the AWS Toolkit for Visual Studio, the ZIP or WAR file will automatically be structured correctly. For more information, see The Elastic Beanstalk Command Line Interface (EB CLI), Creating and Deploying Java Applications on AWS Elastic Beanstalk, and The AWS Toolkit for Visual Studio. Create a source bundle using the zip command. 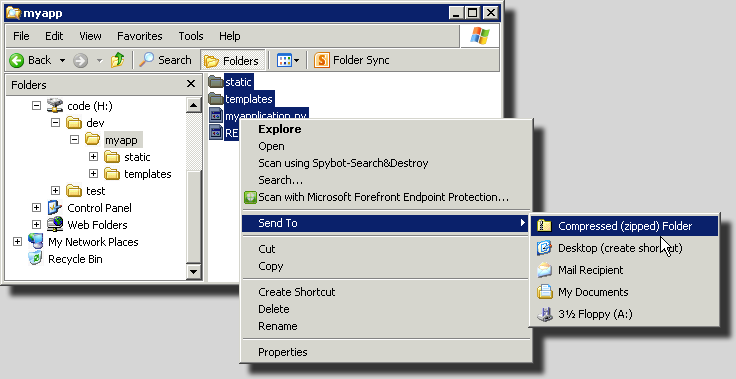 To include hidden files and folders, use a pattern like the following. This ensures that Elastic Beanstalk configuration files and other files and folders that start with a period are included in the archive. For Tomcat web applications, use jar to create a web archive. ~/myapp$ jar -cvf myapp.war . The above commands include hidden files that may increase your source bundle size unnecessarily. For more control, use a more detailed file pattern, or create your source bundle with Git. If you're using Git to manage your application source code, use the git archive command to create your source bundle. git archive only includes files that are stored in git, and excludes ignored files and git files. This helps keep your source bundle as small as possible. For more information, go to the git-archive manual page. When you create a ZIP file in Mac OS X Finder or Windows Explorer, make sure you zip the files and subfolders themselves, rather than zipping the parent folder. The graphical user interface (GUI) on Mac OS X and Linux-based operating systems does not display files and folders with names that begin with a period (.). Use the command line instead of the GUI to compress your application if the ZIP file must include a hidden folder, such as .ebextensions. For command line procedures to create a ZIP file on Mac OS X or a Linux-based operating system, see Creating a Source Bundle from the Command Line. As noted in the list of requirements above, your source bundle must be compressed without a parent folder, so that its decompressed structure does not include an extra top-level directory. 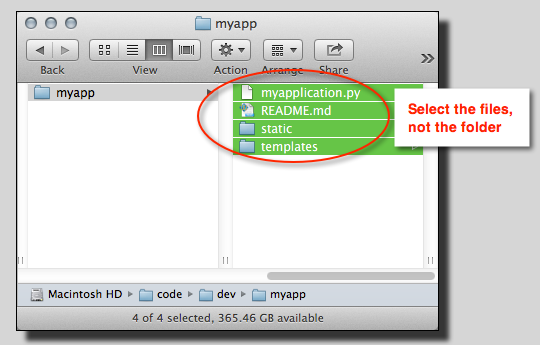 In this example, no myapp folder should be created when the files are decompressed (or, at the command line, no myapp segment should be added to the file paths). This sample file structure is used throughout this topic to illustrate how to zip files. Open your top-level project folder and select all the files and subfolders within it. Do not select the top-level folder itself. Right-click the selected files, and then choose Compress X items, where X is the number of files and subfolders you've selected. 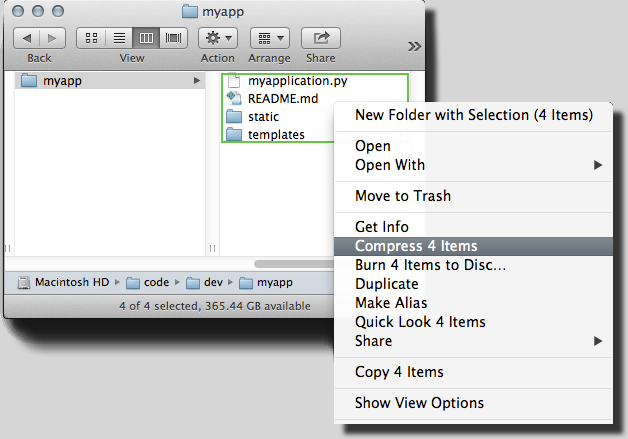 Right-click the selected files, choose Send to, and then choose Compressed (zipped) folder. If you use Visual Studio, you can use the deployment tool included in the AWS Toolkit for Visual Studio to deploy your .NET application to Elastic Beanstalk. For more information, see Deploying Elastic Beanstalk Applications in .NET Using the Deployment Tool. Create the deployment package using the Publish Web wizard in Visual Studio. For more information, go to How to: Create a Web Deployment Package in Visual Studio. 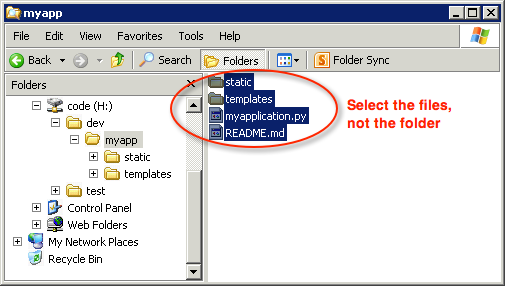 When creating the web deployment package, you must start the Site name with Default Web Site. It you have a .NET project, you can create the deployment package using the msbuild command as shown in the following example. The DeployIisAppPath parameter must begin with Default Web Site. C:/> msbuild <web_app>.csproj /t:Package /p:DeployIisAppPath="Default Web Site"
If you have a website project, you can use the IIS Web Deploy tool to create the deployment package. For more information, go to Packaging and Restoring a Web site. The apphostconfig parameter must begin with Default Web Site. You may want to test your source bundle locally before you upload it to Elastic Beanstalk. Because Elastic Beanstalk essentially uses the command line to extract the files, it's best to do your tests from the command line rather than with a GUI tool. Open a terminal window (Mac OS X) or connect to the Linux server. Navigate to the directory that contains your source bundle. Using the unzip or tar xf command, decompress the archive. Ensure that the decompressed files appear in the same folder as the archive itself, rather than in a new top-level folder or directory. If you use Mac OS X Finder to decompress the archive, a new top-level folder will be created, no matter how you structured the archive itself. For best results, use the command line. Download or install a program that allows you to extract compressed files via the command line. For example, you can download the free unzip.exe program from http://stahlforce.com/dev/index.php?tool=zipunzip. If necessary, copy the executable file to the directory that contains your source bundle. If you've installed a system-wide tool, you can skip this step. Using the appropriate command, decompress the archive. If you downloaded unzip.exe using the link in step 1, the command is unzip <archive-name>.